By LUDWIG VON KOOPA - Just started and bought Pokémon Super Mystery Dungeon! Might be as far as I get. Once upon a time, there was a game series called Pokémon Mystery Dungeon. It was on the Game Boy Advance as Pokémon Mystery Dungeon: Red Rescue Team and it was amazing. You became a Pokémon and had a partner. The Pokémon you had was based on a personality test. Back in Red Rescue Team I was Treecko, and my partner was Squirtle. My team was Team TeamKoopa... 'cause I didn't know they'd prefix "Team" to the name you picked. 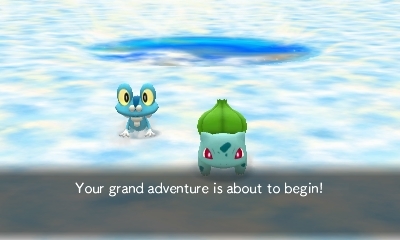 After that, there was Pokémon Mystery Dungeon: Gates to Infinity, generously gifted to me by a fantastic KoopaTV reader for my birthday. The same fantastic person who is sponsoring November-December's KoopaTV Loyalty Rewards Program prizes of a $30, $15, and $5 Amazon codes! (And anyone, including you, can and should try to win those. Start by reading that page to figure out how.) I wouldn't have gotten it myself, since I've heard some bad things about it. Those bad things were... more or less right. There was no fate, destiny, or personality test. You just got to choose between five Pokémon (instead of having, like, nearly 20 possibilities from the previous titles): Axew, Pikachu, Snivy, Oshawott, and Tepig. I chose Axew as my character and Oshawott as my partner. We were known as "The KoopaTV" in the game, which gave many opportunities for screenshots. Except the Pokémon Mystery Dungeon: Gates to Infinity Miiverse community doesn't allow for screenshots. There were no opportunities for anyone with a shell in Gates to Infinity. There was a very lacking selection of Pokémon in general, while its prequels and sequel have every known Pokémon in them. Let's pretend it never happened. 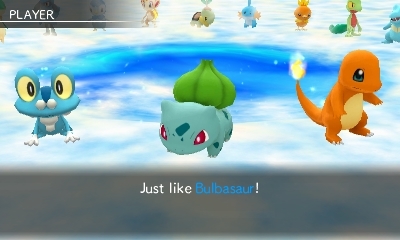 Fortunately, Pokémon Super Mystery Dungeon's does have a personality quiz! And so, you may be wondering... who am I there? How cute. 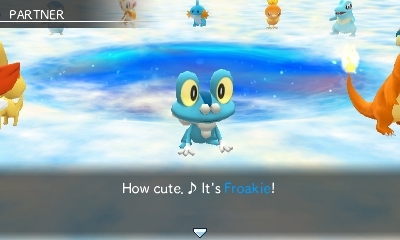 ♪ It's Froakie! ...And that's pretty much what I got up to since I remembered I need to write something for today. Leave me alone and let me play the dang game. You get filler for the rest of the dang holiday week. Yesterday was your big quality article if you wanted one! We haven't even canonically met yet. I don't know if there is a team name in this game, but if there is, I'd love to hear your suggestions for what it should be in the comments! Also, I tried getting the game at retail but failed due to no stock, and got a Pink Yarn Yoshi instead to join my green one. Yikes. However, thanks to Amazon, I was still able to get a physical copy! One disadvantage of physical boxes? Instead of game manuals, they pack in crap like the Pokémon Omega Ruby/Pokémon Alpha Sapphire special demo version as a QR code. How many times are they going to dump that garbage on me? It's been well over a year and it's expired! Bah. Okay, I tried playing for a few more minutes before publishing. Um... I can't progress in the game. Never mind, this whole article, and my purchase, has been useless. You need the L button to play the game, and mine is broken. You didn't need it for Gates To Infinity! It was just strongly encouraged! Here, you cannot get through this room without using the L button. So I just bought a game that, at present, I cannot play. Ludwig needs someone to repair his 3DS, because it's riddled with problems. Or he should purchase a new 3DS and transfer his data to the new one. He needs help with that, too, so give him your suggestions on everything he had questions on! New turtle Pokémon show up, and they might be Bowser's new spirit Pokémon. I named my team One for you. One 4 U. Get it? Anyway, I strongly suggest getting that button fixed pronto, since this is legit one of the best games released this year. I swear, just getting to Lively Town took more effort than I usually put into games these days. I want the button fixed too dammit. I know you can do it yourself, but I want someone else to do it for me because I'm completely inept at that kind of...hardware repair stuff and I don't trust myself. Xbox One, PS4. Wii U. You can probably look at tutorials online and figured it out. I managed to fix my old 3DS when the screen snapped in half.
" PLEASE NOTE: I have quite a bit of experience working with this sort of thing. There are a lot of delicate and small components involved in this repair. If you are not sure of your capabilities, I recommend you have a professional do the work, especially if it is under warranty. This sort of tampering will likely void any warranty. " Try looking for an independent retail game store. The one near me knows how to repair so maybe there are others like that. If you share my level of mechanical know-how.... I recommend replacing it. XD Or finding an expert. I don't know how much you use the 3D, but there are some pretty cheap 2DS deals now. I don't use the 3D at all. I figured out pretty quickly upon getting the 3DS that everyone else around me can see it and thinks it's cool, but I can't see the 3D. Not sure how I feel about going back to the non-clamshell design. Does it mean the 2DS doesn't have a garbage fragile hinge to break? It came with an ORAS special demo version QR code, a code for the PSMD 3DS home menu theme, and a QR code for Pokémon Shuffle. No hinge on the 2DS. xD I don't know if that's good or bad, though. It feels like it would be easier to get the screen scuffed if you carry it around with you. Wow. Those are some odd choices... but I guess they wanted to keep it Pokémon-themed. Yeah, I would either carry it in my bag or my pocket. Just because my Pokémon lack shells doesn't mean my game system should, too! Yes, everything there is Pokémon-themed. Though I'd rather them advertise Pokémon Rumble than Shuffle! I'm sure you can send your 3DS in to Nintendo to fix your L button problem. I sent mine in once when the whole top screen came off... On a limited edition 3DS to boot! They still fixed it, and there wasn't even any extra charges due to it being a limited edition. I'm sure it wouldn't cost you as much as it did me, as yours is a simple button repair. As for the game itself, I haven't played a mystery dungeon game in a LONG WHILE due to me losing interest. This one looks fun, actually. With Gen 6 involved, might give it a go. Also, you should name your team TeamVonKoopers. Well it's more than a button repair. I want my touch screen repaired too, the OTHER button (R), and the Circle Pad to not come off. Lost interest in dungeon-crawling, in gaming, or in Pokémon? Oh, only lost interest in the Mystery Dungeon series. Hasn't really sparked my interest but I'll look into this new one. Well, if you skipped Gates to Infinity then it's been a long time since one has been available. Unless you count non-Pokémon branded Mystery Dungeon games. ...so basically no 3DS game has useful amiibo compatibility. I named my Team "Von Koopas"
...Thanks for the pointless comment?